All this week we’re revealing The Secret History Of Rock Paper Shotgun, as retold through hazy memories and an archive of the emails the original four founders sent each other at the time. You can read Parts One and Two to achieve some notion of coherence, and then continue on with Part Three below. Today, with a name picked, we race forward with establishing a company, convincing a bank we’re not terrorists, and secretly running the site for a full month without telling anyone. And then we had to tell people, especially those who would be most annoyed we were doing it. The four of us, registering our accounts on the WordPress that sat on our freshly registered domain. The same day I sent out an email called “Everything Ever”, a master document that contained all our logins, usernames, admin passwords, FTP details, POP3 login, and support details for our long-time hosts, Positive Internet. And gosh are we indebted to Positive Internet. It’s a web hosting company, co-run by my friend Nick Mailer, who sportingly set us up on one of their shared servers. I’m fairly certain Nick was just patronising our little project. I’m absolutely certain he wasn’t expecting us to be breaking that poor server within just a few months. The reality is, if Positive had charged us for the internet traffic we were using, RPS would never have gone anywhere. Another thing we had to do was set up a bank account. I really cannot under-emphasise just how much we weren’t the four people to be starting up a proper grown-up business. We muddled through, certainly, but goodness knows I’m not sure how. Having a limited company involves all manner of paperwork, for which Jim did the vast majority of the work, but even so it inevitably involved Kieron losing something vital, everyone forgetting to post stuff, and one missed signature on one piece of paper causing entire processes to collapse. Because rather than going for a mad hot launch on August 20th, we started running RPS the moment we had the domain and Alec’s hacked together WordPress template in place. We just didn’t tell anyone. The idea was to have a site that looked like it was already up and running by the time anyone found out about it. We mentioned it to a few select chums, and otherwise worked on it as we planned to post-announcement for the first six months. The four of us aiming to create two posts a day, juggling this between all our usual freelance efforts that paid the rent and bills. So by the time August 20th came, there was plenty of scrolling for any readers to do. There was one other big thing we needed to do: Tell our other employers what we were up to. As I’ve alluded to in previous parts, things were getting tense in the world of freelance, as decreasing pay forced us all to work for rival outlets. The main conflict fell between PC Gamer, the magazine in which the four of us had perhaps earned our reputations, and Eurogamer, the website on which the four of us had perhaps been set free to fully explore the excesses of our styles. Jim and Kieron had both worked full-time at PC Gamer, while Alec had been full-time at PC Format but freelanced across. 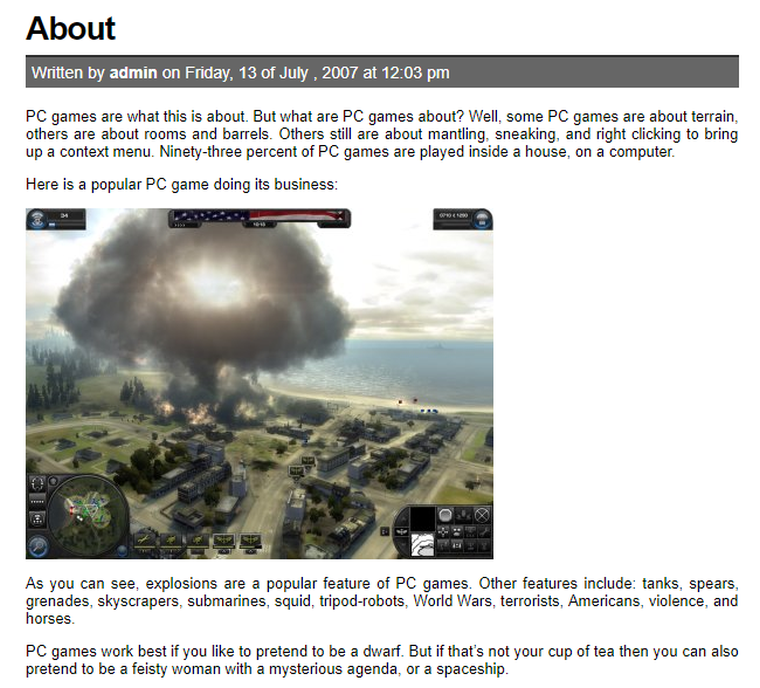 I had only ever been a freelancer, but spent a decade writing in all but every issue of PCG. 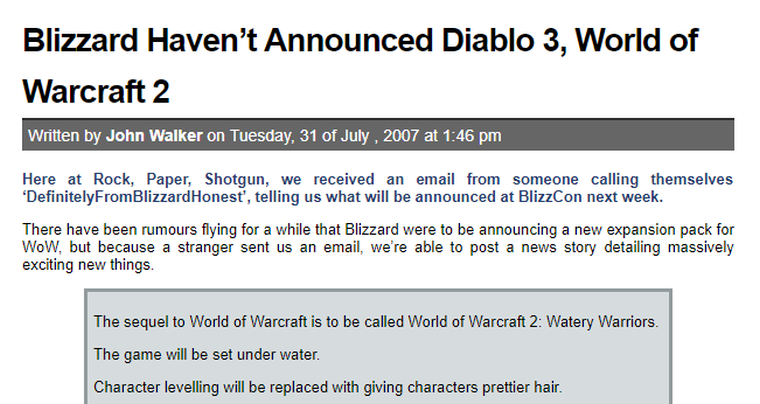 By this point we were all freelance, and Eurogamer’s larger word counts, and far more liberal editorial policy, was a very different writing discipline. One that released the best and worst in all four of us. Then we were also appearing in the earliest, significantly less hateful version of The Escapist, popping up in Edge (plus Jim and I both had stints anonymously writing their entire website for them) and various other Future mags. We were spread all over, which you could sensibly argue wasn’t great for bringing in a wider range of voices, yet were still scraping by. And of course now, to make matters more complicated, we were aiming to continue writing for these outlets while setting up our own competitive site! Jim, of course, wrote the email to our Gamer bosses. I think what’s most telling about this particular email is that no one from Gamer even replied. This was two days before launch.